A group of President Trump supporters rallied in front of Trump Tower in support of the president’s 2020 election bid, and celebrated the end of the Russia collusion investigation by Robert Mueller. 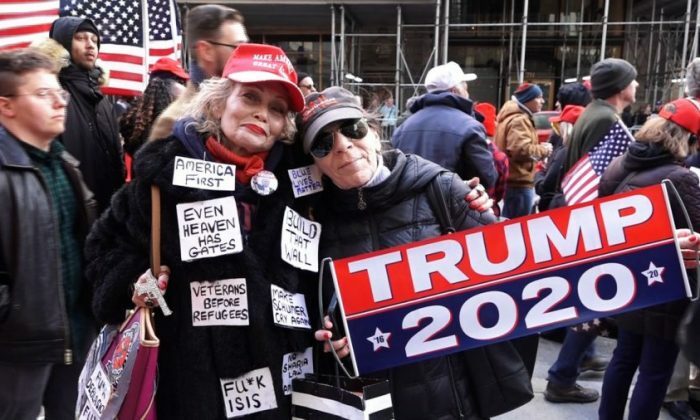 A grassroots collection of Trump supporters in New York, New Jersey, Connecticut, and Pennsylvania came together in New York City on March 23 to support the president. When asked about what had brought them there, Brooklyn resident and rally attendee Hedy Aldina told NTD, “because we want to support President Trump. Another attendee was asked about how unusual the rally was, due to New York’s well-known Democratic and leftist leanings. “Well actually, New York state is not. Its just the five boroughs that is liberal, real liberal and Democratic. But outside the boroughs, [there are] a lot of conservatives and Republicans out there,” rally attendee Derrick Gibson told NTD. The event organizer Aidan Rowan expressed the need to show support for Trump in the places with a predominately liberal climate like New York City. “The purpose of the event is to show the president that we have some real good support up here in the northeast, especially in these liberal states,” Rowan told NTD. Gibson expressed his agreement with President Trump’s views on socialism, and said he supported Trump’s fight to keep further socialist influence out of U.S. governance. Gibson also explained how Trump’s policies have positively impacted business owners like himself, and how he has benefited from Trump’s urban revitalization programs aimed at benefiting black Americans. “We like Trump’s policies. They’re good for business. Trump should be mayor right here, he should be governor right here, and he should be the president at the same time. It makes sense,” Gibson said. The gathering happened to take place one day after Special Counsel Robert Mueller submitted his report on Russian collusion with Trump in the 2016 U.S. Presidential election, effectively ending the investigation. The rally had been originally planned for Trump’s reelection but turned into a celebration party for Trump’s vindication after the almost two year long Mueller probe. Mueller submitted his report to Attorney General William Barr on March 22 and he did not recommend any further indictments. “After more than 2 years of non-stop conspiracy theories from CNN, MSNBC, Buzzfeed and the rest of the mainstream media, as well as daily lies and smears coming from Democrats in Washington, the Mueller Report proves what those of us with sane minds have known all along, there was ZERO collusion with Russia,” Donald Trump Jr. wrote in part of a statement posted to Twitter. Trump Jr. still remained skeptical that what President Trump has called a “witch hunt” will end, despite the Mueller probe outcome. “Sadly, instead of apologizing for needlessly destabilizing the country in a transparent attempt to delegitimize the 2016 election, it’s clear that the Collusion Truthers in the media and the Democrat Party are only going to double down on their sick and twisted conspiracy theories moving forward,” Trump Jr. continued.